We hope you are enjoying these Artist Limelight articles as much as we like presenting our ALSC artists to you! Today’s feature is a visit from “across the pond” to the bucolic south coast of Boscombe, England and the art studio of — Paul Daviz. Paul is a graphic designer and illustrator with over 30 years of experience in the fields of advertising, design, and publishing. His early years growing up in the middle of the textile manufacturing towns of northern England almost read like a Charles Dickens novel. Were it not for the decline and loss of the cotton industry after World War II and the shift to cheaper textile manufacturing to Japan, India, and the US, Paul may have had his future sealed as a weaver or spinner toiling away on an industrial machine as generations of his family did before him. Well, maybe… or maybe not. You just cannot underestimate the magical power of fate, destiny or serendipitous events that occur along the trajectory of an artist’s path. Sometimes weird stuff just happens. For Paul, growing up around the thriving cotton mills of Blackburn, his future may have looked bright at the time. Though his family was modest, they were conditioning him to work in or be of service to the cotton weaving industry just as his parents, grandparents and even great-grandparents had. But Paul remembers a lot of creative expression in his early childhood years. As one of three brothers, they all enjoyed drawing. They were given remnants of wallpaper rolls to draw on the back. According to Paul, the continuous roll “was perfect for drawing battle scenes, knights on horseback, castles, catapults, bows and arrows, cowboys and Indians, Dr. Who and the Daleks.” Paul doesn’t believe he was any more talented than his two brothers but he kept at it. He loved to draw, constantly. And he drew on everything! On the back of the electricity bill, his school books, even the white cardboard that stiffened new school shirts was confiscated. Christmas always meant a new drawing pad, paints, and pencils. Then one fortuitous event in his childhood would change Paul’s life forever and some great expectations emerged. “Around age 10 or 11, I was given a Mad magazine. It was a pivotal moment for me. I was immediately awe-struck by the work of legendary illustrator, Mort Drucker. I had been bitten by the cartoon bug. I decided there and then what my career path would be” says Paul. However, Paul would soon find out that a career as a cartoonist wasn’t exactly waiting for him at his school’s Career Advice Day. The Career Advice Counselor thumbed through her Rolodex and offered him a choice of window dresser or printers’ apprentice. His academic results were not good enough for a printer’s apprentice and well, window dressing, that was out of the question. The system was designed to educate children but they were being groomed to go into the cotton mills anyway. By the time Paul left school at age 15 in 1975, the cotton textile industry practically ceased to exist. The 1912 census records show almost half a million people in the Lancashire area were employed in cotton production. 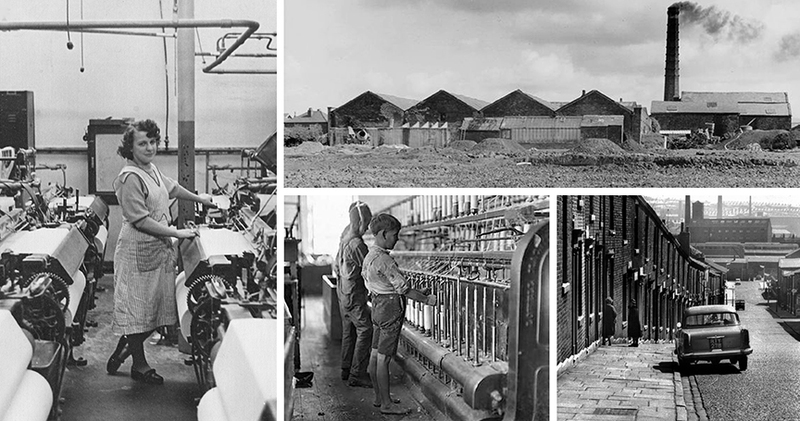 By 1975 there were only 2,100 looms running in the town of Blackburn from a high of 79,405 machines in 1907. During the 1960’s and 1970’s, cotton mills were closed at a rate of almost a mill a week. Paul found work where he could like so many others. For a while, he unloaded shoe boxes from trucks at a slipper factory. On his downtime, he would draw caricatures of his fellow workers on the flattened boxes. The last straw was when Paul was reprimanded for drawing on “important things” and given an official letter of warning — which he promptly drew on. Still dreaming of a career as a cartoonist, Paul enrolled in a graphic design course at his local college. The course didn’t rely heavily on drawing skills, but he learned a lot about printing techniques, typography, layout and other very useful information. He learned how the business worked and all about the different areas of the visual communication industry, and particularly illustration. His college tutor informed him that if he wanted to be an illustrator then he would have to be in London. At the time and being the small town boy that he was, London was over 200 miles south, but it may as well have been on another planet. Even with the encouragement of his tutors, he wasn’t brave enough to leave. No one left Blackburn in those days. Paul stayed in Blackburn and completed the two-year college course. After that accomplishment, he had enough confidence to apply for a job at a local greeting card publishing company. He started in the technical purchasing department buying reproduction, cutting dies and forms, and proofing. Paul yearned to be in the art studio creating and producing cards but his boss would not allow him to transfer. After four frustrating years, he had had enough. He quit his job, took his newly married wife, and moved to London. He was met with scorn, ridicule and suspicion from family and friends, but he didn’t care. In his spare time, he created a whole new portfolio of work and contacted an artist agent (Garden Studio). To his surprise, they agreed to represent Paul. It was a huge boost to his confidence. (An agent/artist relationship that lasted 30 years!) In January of ’84, they made the move to London. London was amazing! Within weeks he had a job to create a line of greeting cards — the Sloane Range (think Lady Di fashion). Soho was London’s creative hub and it was exciting. PauI tramped all around the place spotting celebrities and applying for jobs. He showed his portfolio to art studios that serviced the many advertising and design agencies that he was interested in. He was determined to succeed. Paul carried on through the years working as a graphic artist visualizing for ad agencies, publishers, magazines, and newspapers while growing his illustration portfolio with some amazing commissions. (One was a George Burns illustration for the BBC’s Radio times Christmas edition). Those early days of art studios changed significantly with the advent of the digital age and computers. Gone was the ink, paint, paper, and glue — now replaced with people staring at computer screens and wearing headphones. It forced artists to change and learn new skills and clients were demanding digital art. For Paul, it was another opportunity to grow and develop, learning all of the new software to create art and adding some computer animation skills as well. The next big career shift for Paul came in 2013 when he amicably parted ways with his longtime agent. He was restless. For the past few decades he had been creating work as a cartoon/illustrator but as he put it… “my spirit wasn’t happy”. He wanted to explore more color, design, form, and type. Paul explains it this way. Now, without an agent and a total shift in his artistic direction Paul did what he usually did, he got busy. He worked on his new digital art style that was less hand-drawn cartoons and more complex digital illustrations. 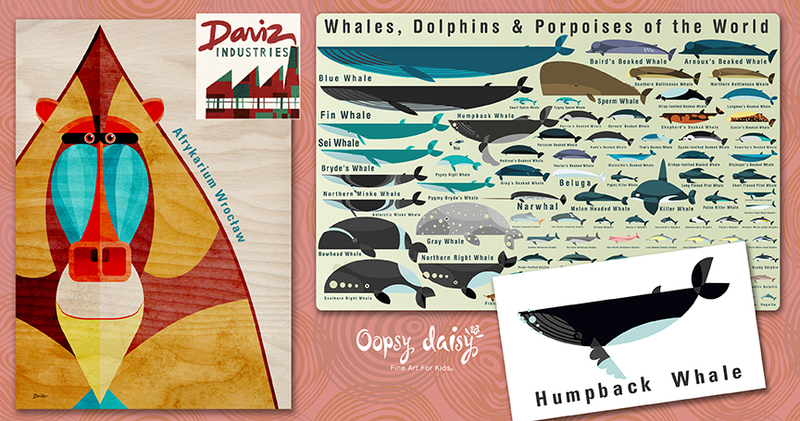 He worked on an educational poster design based on the Department of Agriculture and Fisheries posters he used to see in fish and chip shops. He developed a Christmas greeting card line in his digital style and started experimenting with and working on surface patterns. In early 2016 Paul came across the ArtLicensingShow.com® (ALSC) website and joined specifically to further his connections to Art Directors, Buyers and manufacturers in the art licensing industry. Although this new direction for Paul and his art has changed his income significantly, he feels like he is planting lots of seeds. He is much happier with the work he’s producing and getting appreciative messages and feedback. 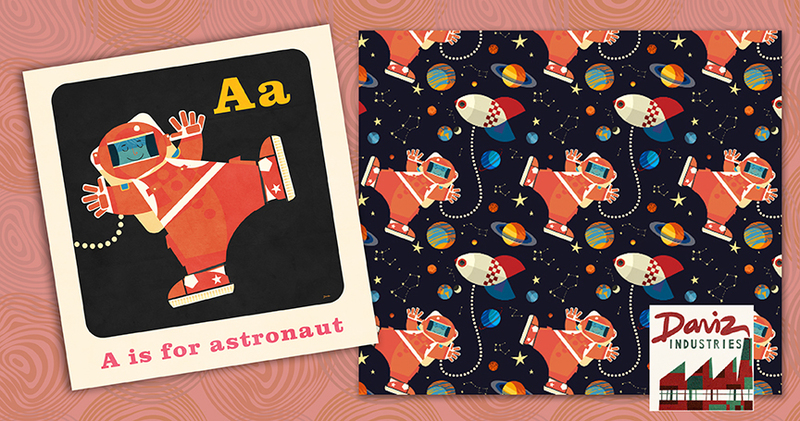 He especially likes designing for boys and loves seeing his work adorning a wall or produced as a jigsaw puzzle. 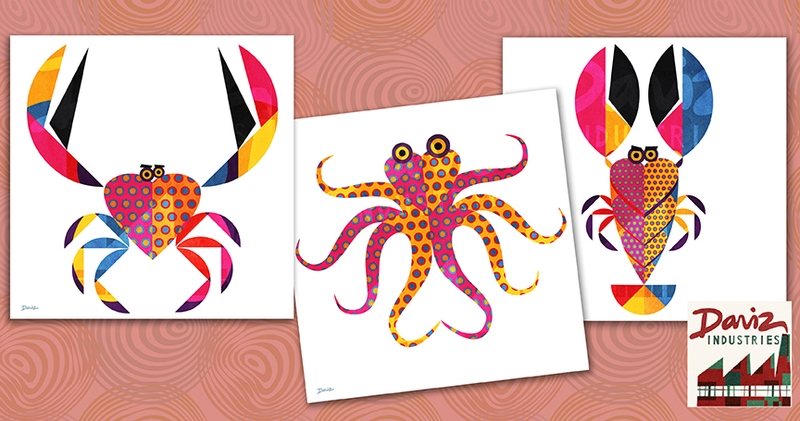 As well as marketing his own art prints and postcards locally in the UK, Paul has licensed his work on coasters, wall art, jigsaw puzzles, and storage boxes. Like many artists, it has taken Paul a long time to hone his skills and develop his multiple styles over several decades. He’s passionate about his art and still draws constantly. When he was a little boy, people use to say… “give him a pen and paper and he’ll draw quietly in the corner”. And in a Charles Dickens sort of way, Paul is still doing the same thing to this day. Though, with a lot more Great Expectations for his art and its presence in the world. Paul Daviz is a highly skilled graphic artist with over 30 years of experience in the fields of advertising, design, and publishing. After giving life to other people’s creative ideas, he is now delighting audiences with his unique graphic style of images and humor. His beautiful art can be found on products ranging from coasters, greeting cards, wall art, jigsaw puzzles and paper products. 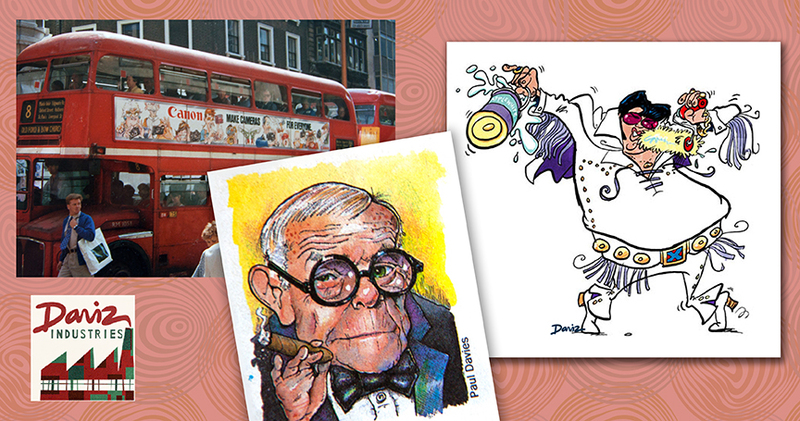 He lives with his family in Boscombe on the south coast of England and claims his great influences are Mad Magazine, Ronald Searle, Mort Drucker, Jack Davis, the art of small ads, cheap cinema advertising, and Soviet matchbox covers. Connect and request access to Paul’s complete portfolio on the ArtLicensingShow.com® (ALSC) and visit his website www.animatics.co.uk. This entry was posted in Art Licensing Show + Tell, Artist's Journey, Limelight Licensors on September 27, 2017 by Art Licensing Show . ← Baby Pattern Design Art Challenge with CLOTHWORKS® ~ TOP 6 Winners! What a journey! Thank you for sharing- so interesting! Wow, I was so impressed and inspired by this great story and the amazing art you produce Paul ! Thank you so much for the reminder of the amazing dividends that hard work, curiosity, talent, willingness to adapt, and lifelong-learning produce! So blessed that you are a part of our community! Great read. Ah Cow Gum and Spray mount – the memories!! All the best with your creative journey Paul! 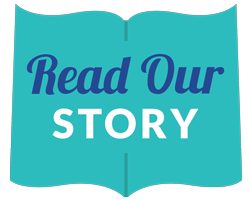 I truly enjoyed reading your story. I love your work and look forward to seeing more of it! Wow! What a write-up! And what a story, Paul Daviz! I love your style and your characters. Paul, thanks for sharing your art journey. Best wishes for continued success! Thank you for sharing your art journey with us Paul! I so enjoyed working on your story with you! God bless Mort Drucker! All the best to you and good wishes for more art licensing success. Your ART is fabulous!!! Oh! And big thanks to Valerie and Cherish and everyone at ALS for giving me the opportunity. Aww! Thank you all for your lovely words! It’s the first time I’ve written my story down, it was a great experience for me. Thanks again for the best wishes. Paul! What an inspiration to all of us. Thanks for sharing your journey!! So great to read a fellow artist’s journey. I wonder if many of us have had similar winding paths to get to where we are doing what we love the most, I know I sure have! Love your work, Paul, and hope you get the recognition your work deserves! What a wonderful story of Paul’s creative journey …to be continued with more successes! Welcome, Paul Daviz! Reading about what brought you here was very enjoyable. Your work is excellent! Best wishes for your goals in art licensing. Wonderful artist and inspiring journey. Can’t wait to see more of Paul’s art, and hear more about his well deserved successes! Bravo! What a wonderful read. Ah “Spray mount and Cow Gum” The memories!! All the best Paul with your continuing creative journey and success.